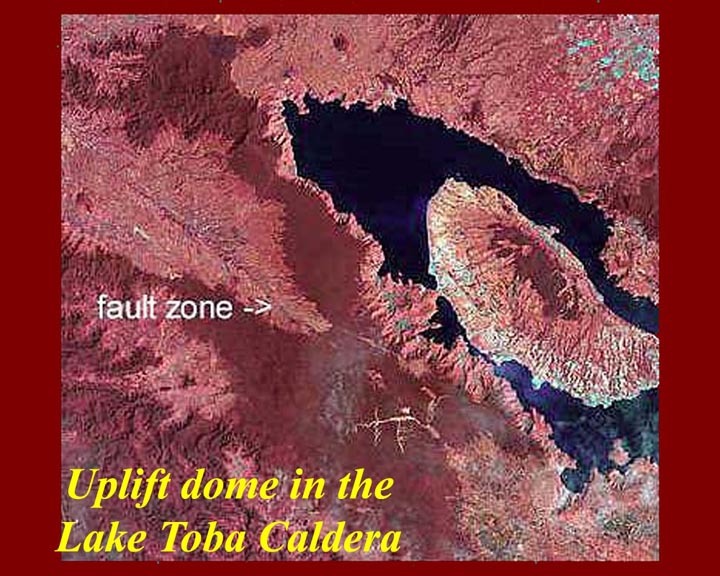 Calderas are formed when surface formations collapse into voids caused by expulsion of magma. Some calderas are formed inside existing volcanic cones, but the "supper" calderas are often just huge depressions without a surrounding cone. 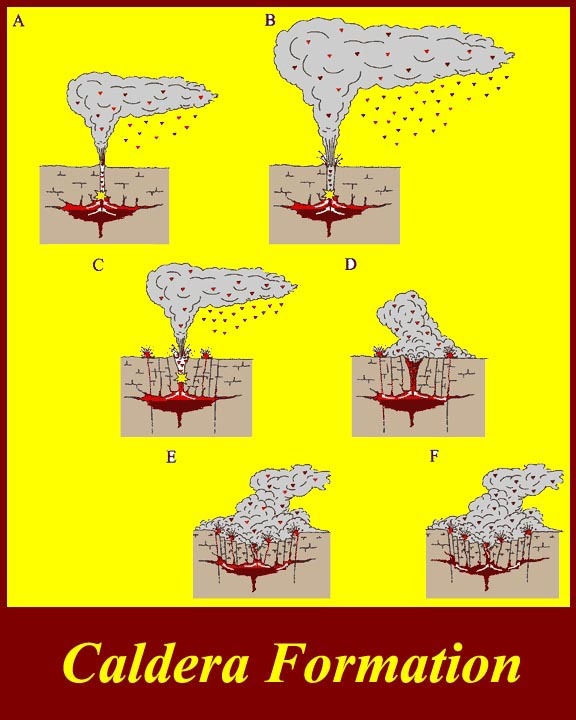 The graphic shows the amount of ejecta in some prehistoric eruptions that produced "super" calderas and compares that with the ejecta of much smaller recent eruptions. 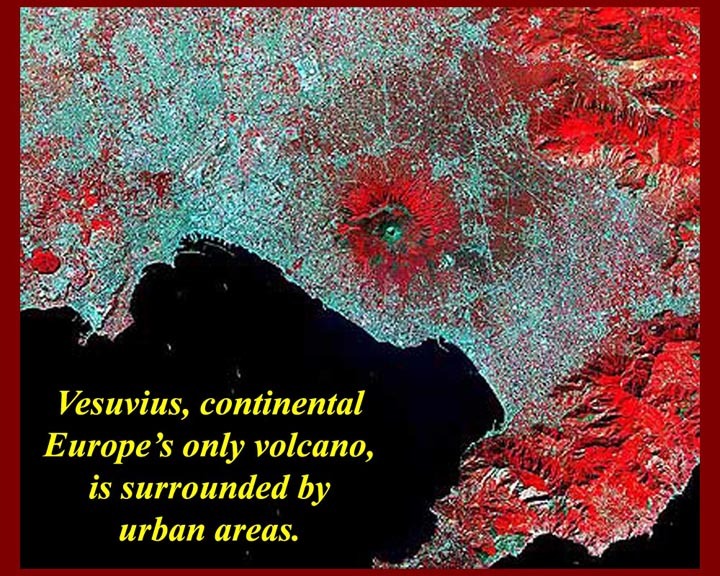 The 79 AD Vesuvius eruption would have fallen between the two smallest blocks. 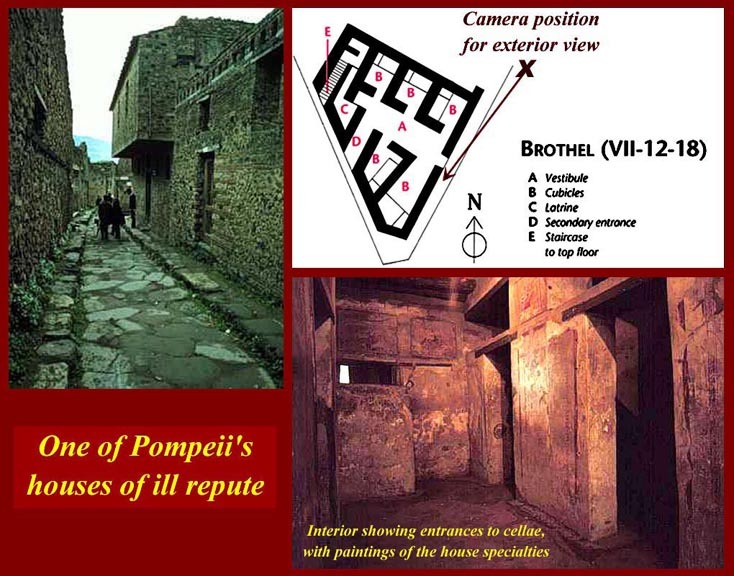 The known death toll of the 79 AD eruption-- essentially, the bodies recovered since Pompeii and the surrounding communities were rediscovered -- was also not extraordinarily large for volcanic eruptions, but there may have been many more killed in the countryside. We are forced to consider why that particular eruption has caught our imagination. Acronyms: DRE = Dense Rock Equivalents. 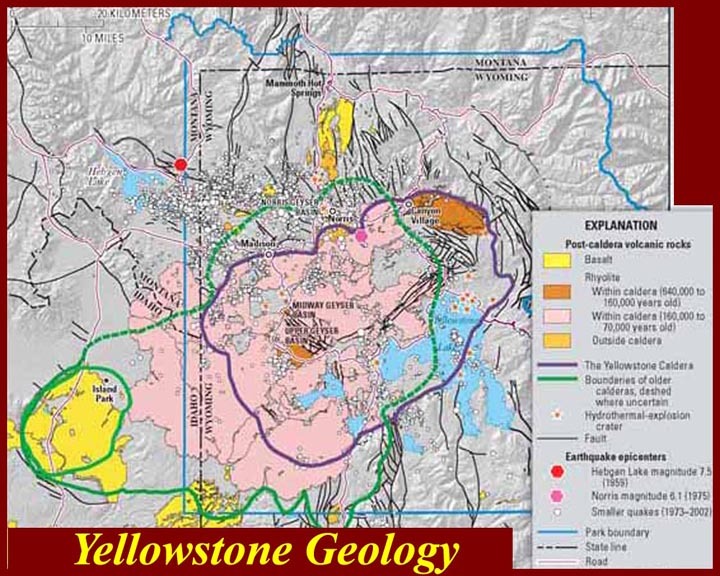 Geology of the Yellowstone caldera. 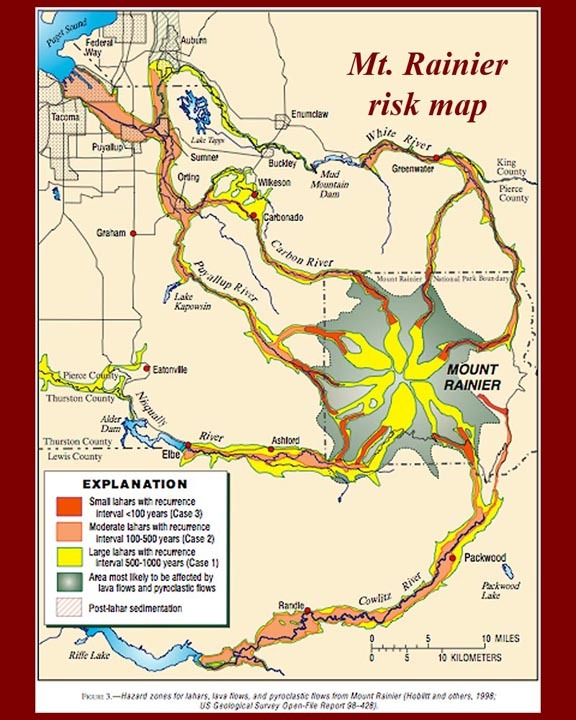 Volcanism in the US Northwest. 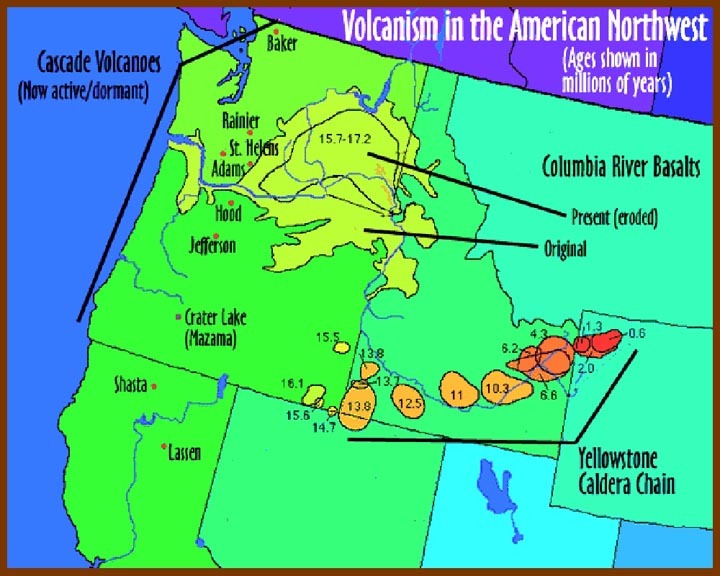 Two different kinds of volcanism are present: (1) in the Pacific Northwest, the Cascade Range volcanoes are caused by subduction, while (2) the activity in the interior (along the Snake River Valley) is the result of a "hot spot", possibly fed by a "super plume" the stretches well down into the mantle of the Earth. Although it looks like the "hot spot" is drifting to the northeast, scientists believe that the continental crust is what is in motion, toward the southwest. Five meters of uplift in a single year seems like a lot, but USGS scientists are not unduly concerned, because it is occurring over a very wide area and, thus, does not appear to be overstressing the surface at any particular spot -- a five meter bulge in one or two kilometers of surface would be a problem. Nonetheless, this not so "brady" (= slow) bradyseism indicates an increase of subsurface pressure, which USGS is closely monitoring. 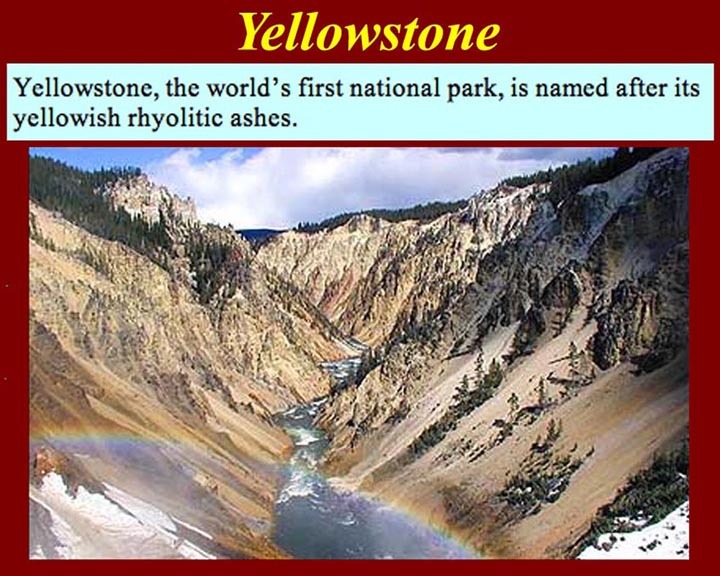 The yellow stone at Yellowstone is rhyolitic yellow ash -- fine particles of yellow rhyolite that are somewhat consolidated. Rhyolite is a fine-grained extrusive volcanic rock, similar to granite in composition and usually exhibiting flow lines (not usually visible at yellowstone due to the fact that it was deposited as "ash"). Rhyolite is highly acidic and has approximately 69 percent silica and high concentrations of potassium and sodium. 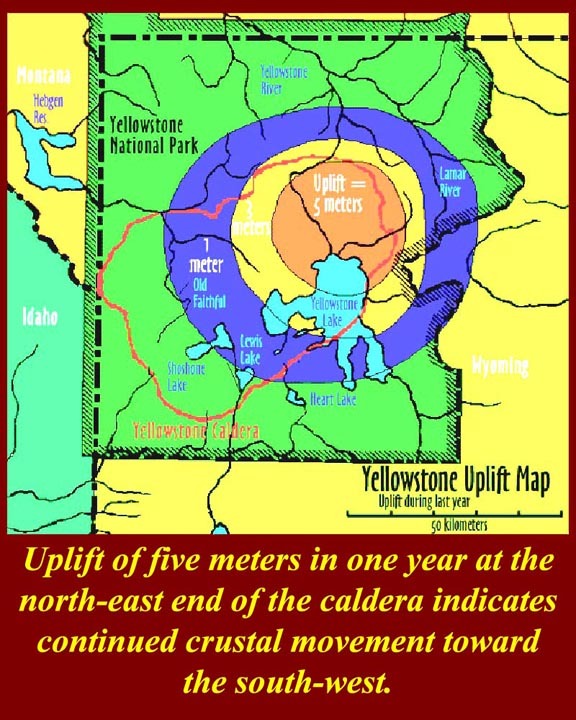 The map shows overlapping ash falls from successive caldera-forming eruptions caused by what is now the Yellowstone hot spot. 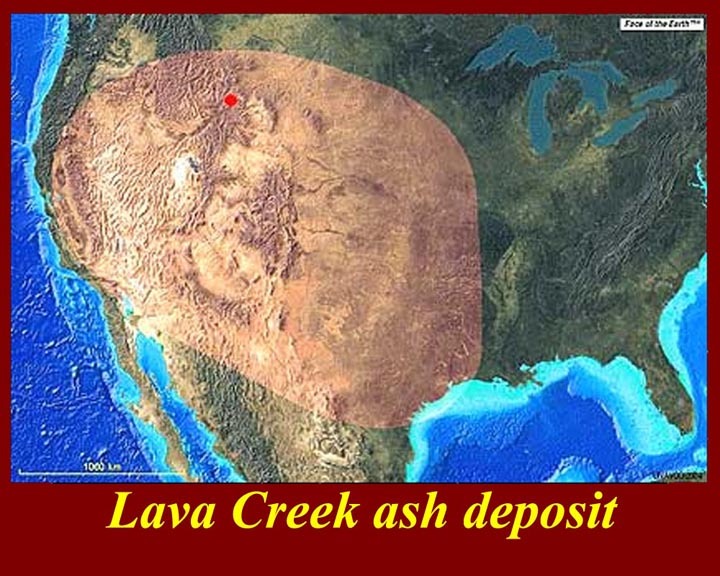 The Lava Creek ash fall was the result of the eruption that produced the Yellowstone Basin caldera. That eruption occurred about 600,000 years ago. 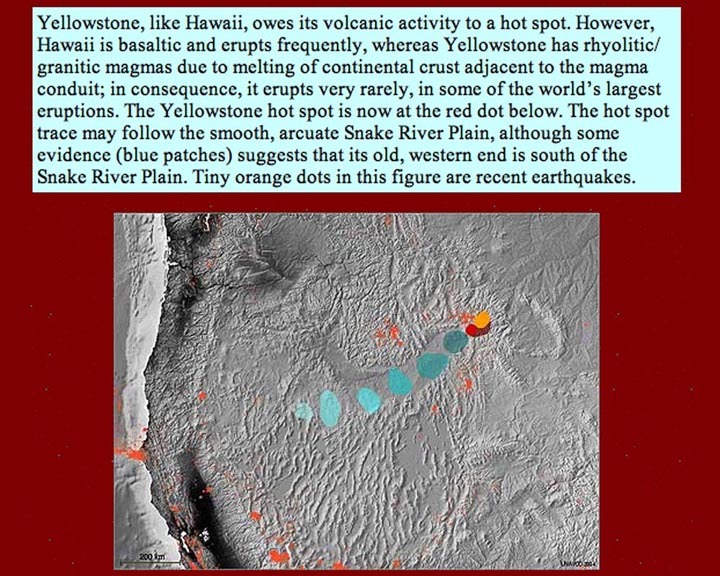 Since the last three major eruptive events of the hot spot were about 600,000 years apart, there has been much public speculation -- mostly by non-experts, but including some volcanologists -- that another major eruption is "due" or "overdue". Many volcanologists disagree, pointing out that three events are not enough to establish regularity and that the structures of zircon and quartz crystal within the ejecta of the three events indicate a waning cycle. 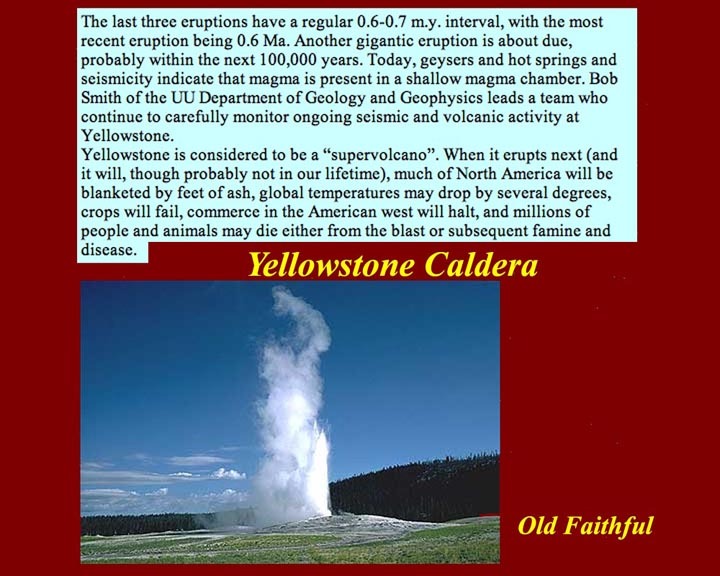 Old Faithful is a surface indicator of the subsurface heat of the Yellowstone caldera. The text is from a volcanologist of the "eruption is due" school. 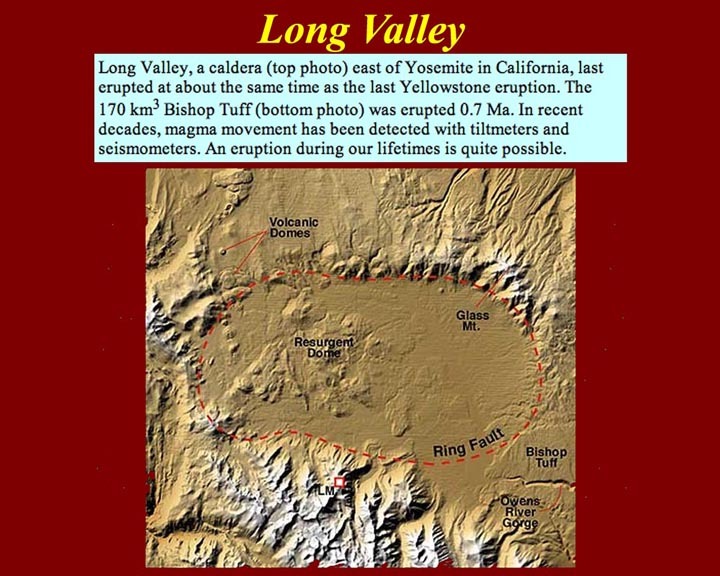 Long Valley in California east of Yosemite is another western super caldera that last erupted about the same time as the Yellowstone eruption. 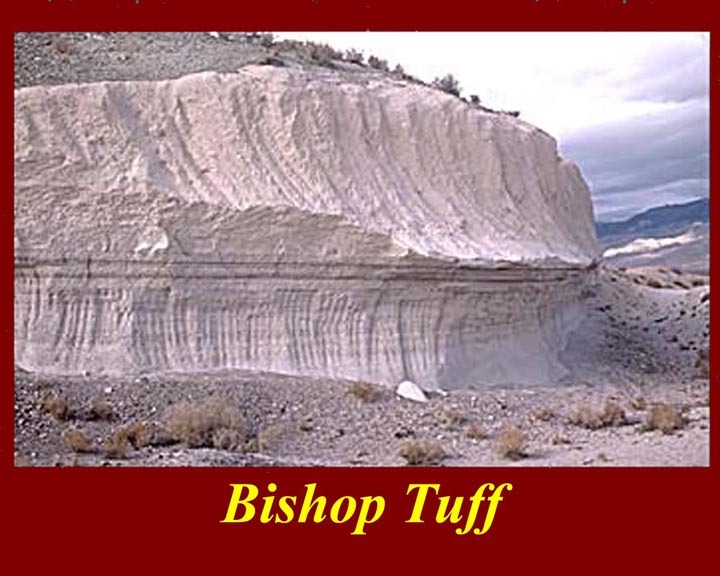 The product of the Long Valley eruption is known as the Bishop Tuff. Tuff, as we know, is consolidated ash. An exposure of the Bishop Tuff. 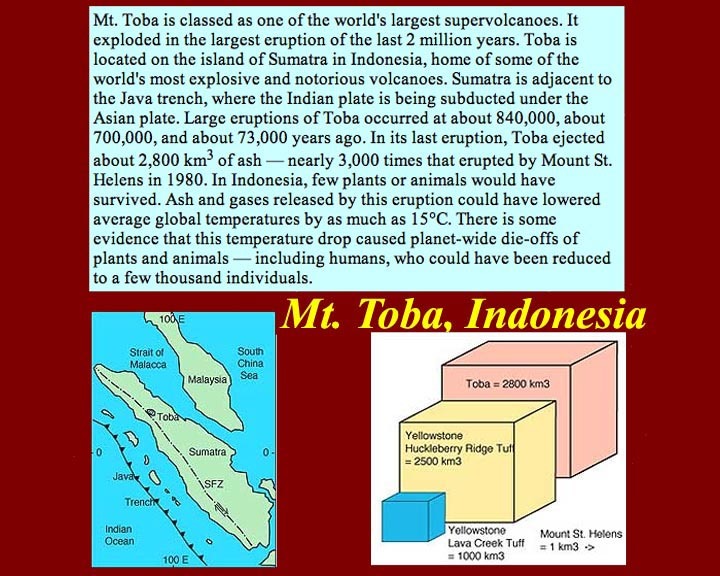 Mount Toba in Indonesia is one of the largest super volcanoes. 73,000 years ago it spewed 2800 cubic kilometers of ash that lowered the temperature of the whole planet and caused massive die-offs -- it was a major contributor to that era's "natural selection" of humans and other terrestrial life. That 2800 cubic kilometer eruption was almost 3000 times the size of the Mt. St. Hellens eruption of 1981. 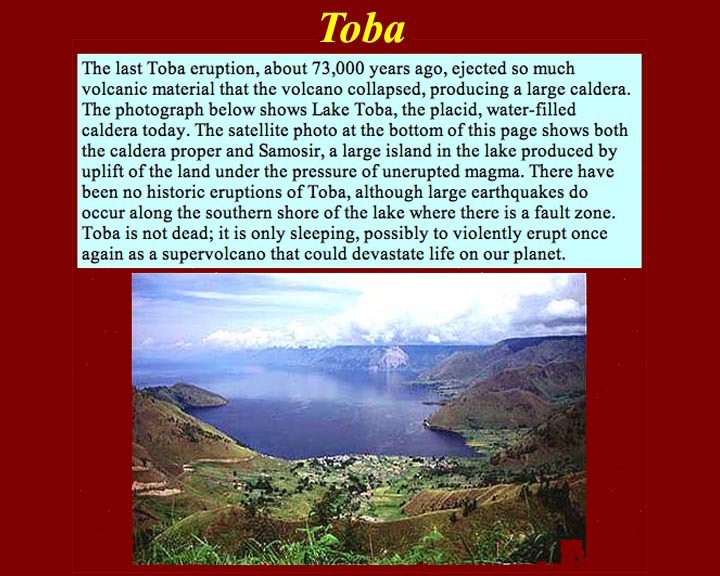 Lake Toba is the water-filled caldera of the eruption of 73,000 years ago. The Lake Toba island is a volcanic uplift dome. The last eruption of Mt. 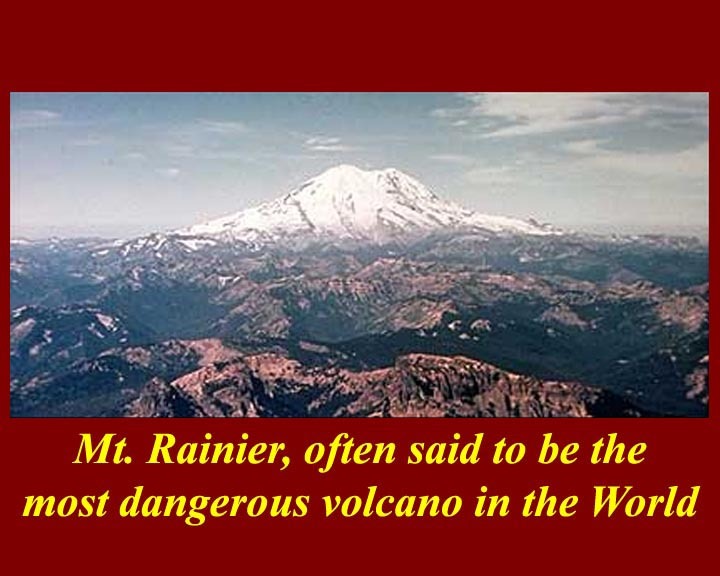 Rainier was about 2200 years ago, but destructive lahars have occurred much more recently. Lahars are mud and water flows caused by glacier melt due to volcanic heat or due to rain water mixing with loose ash. The Rainier lahars are exacerbated by crumbling rock caused by vocanic acid fumes. Mt. 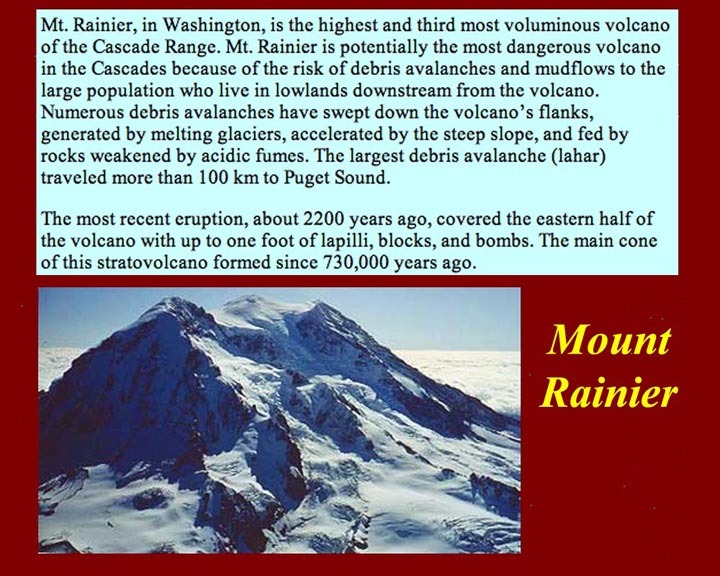 Rainier is often cited as the world's most dangerous volcano, because it is close to major population centers. It's only real competition in this regard is Vesuvius. 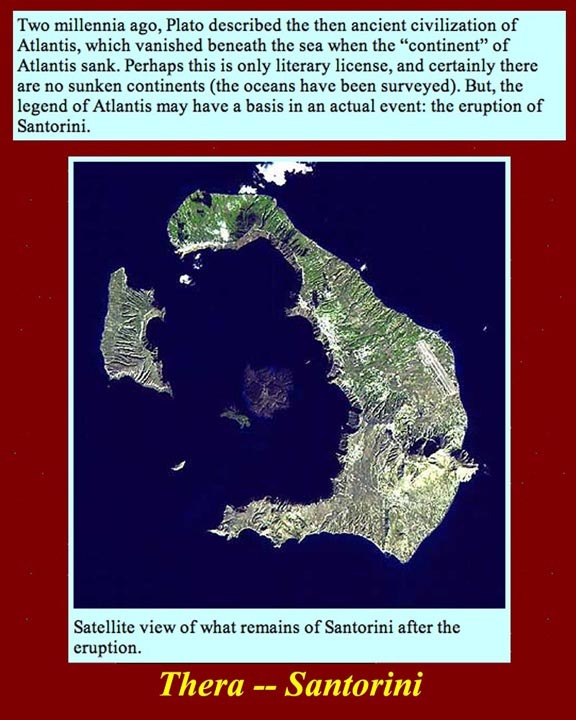 The explosion of the Mediterranean island of Santorini, ancient Thera, is thought to have been the basis for the Atlantis legend. Santorini is 70 miles north of Crete. 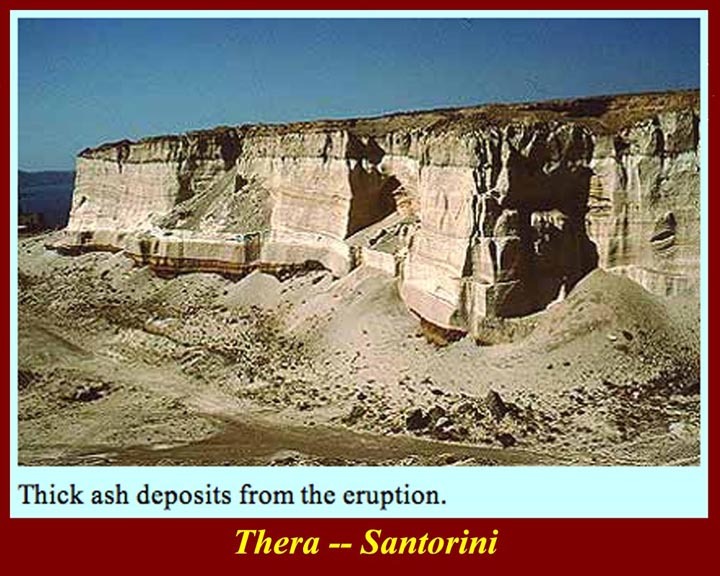 The size and precise date of the Thera/Santorini eruption are not precisely known, but the ash deposits throughout the eastern Mediterranean area are manifest. Some volcanologists and archeologists attribute the end of the Minoan civilization, which was centered in Crete, to the eruption and its tsunami after-effects, and the biblical "parting of the Red Sea" by Moses is also sometimes tied to the eruption (but much less persuasively). 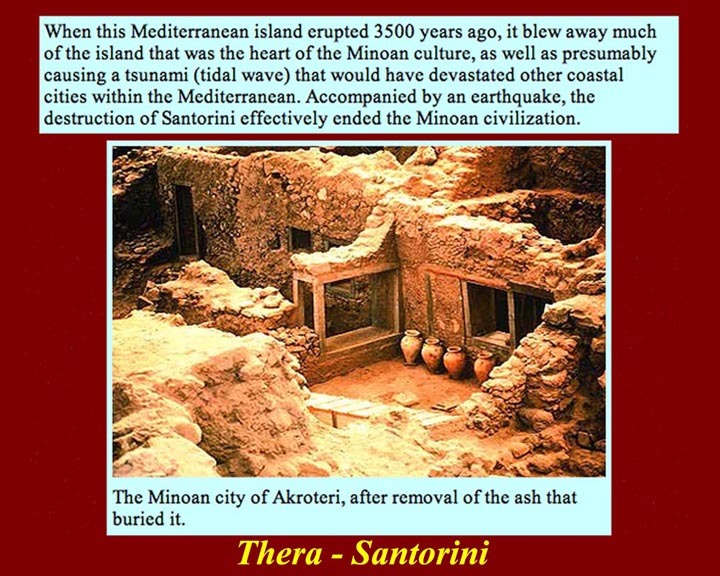 The Thera/Santorini eruption (about 3500 years ago) destroyed a Minoan city on Thera now known as "Akroteri". 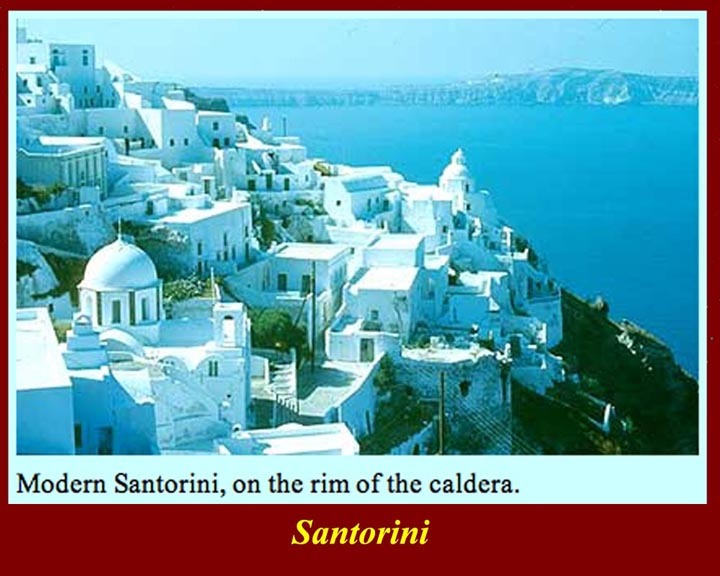 Santorini town, on of those wonderful white Greek Island towns, is on the rim of the caldera. Vesuvius, the star of this, is a contender for the "most dangerous volcano" title. Like Mt. Rainier, it is densely populated. If you saw the 1969 movie Krakatoa East of Java, you know the story -- sort of. 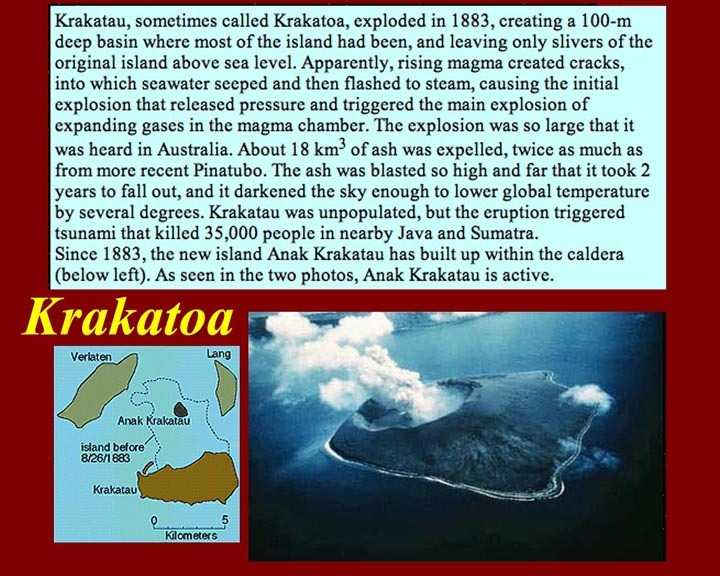 Even the title was wrong: Krakatoa is west of Java. The 1883 eruption was heard in Australia and tsunami circled the whole planet. 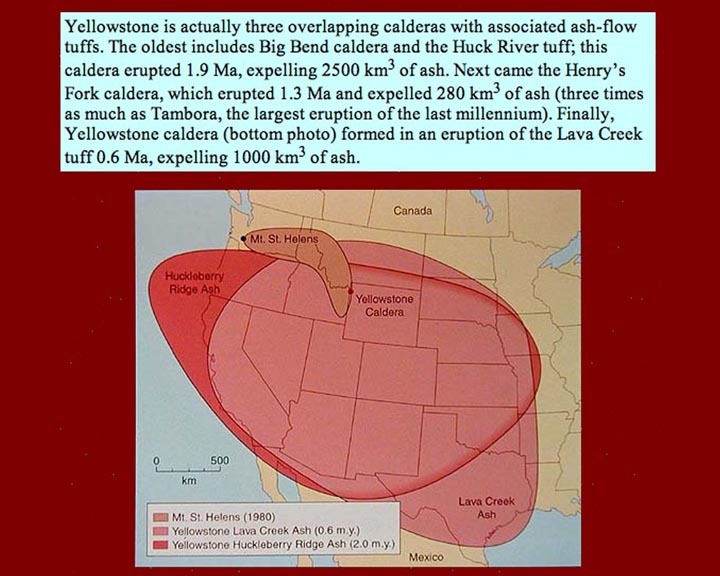 It was a major explosion but small potatoes compared to the ancient supervolcano eruptions. 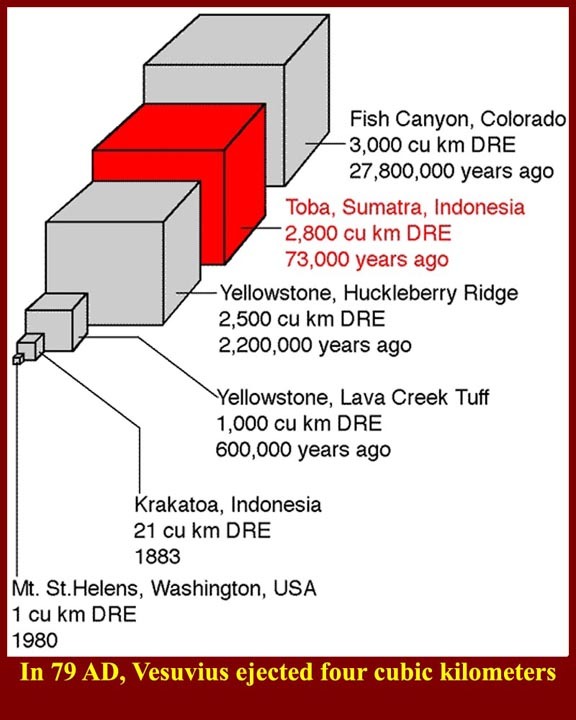 Toba, remember, blew out 2800 cubic kilometers of ejecta: Krakatoa's products were a paltry 20 cubic kilometers. Nonetheless, Krakatoa's eruption was called the largest in "modern times" -- meaning since about 1815. A new volcano has grown in the center of the Krakatoa lagoon. It has been active since 1883, and the locals like it that way: a slow release of pressure is better than building up for another cataclysmic event. 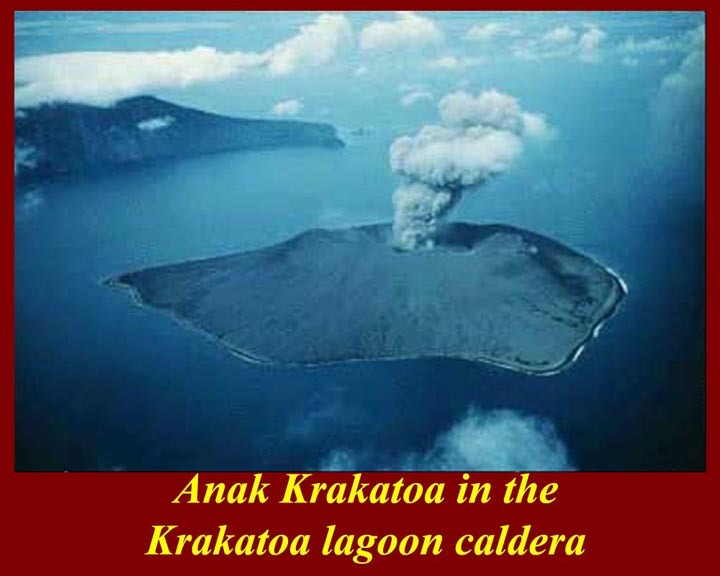 Krakatoa is just one of dozens of "major volcanoes" in Indonesia. The really big one is Tambora (and it also really is east of Java). 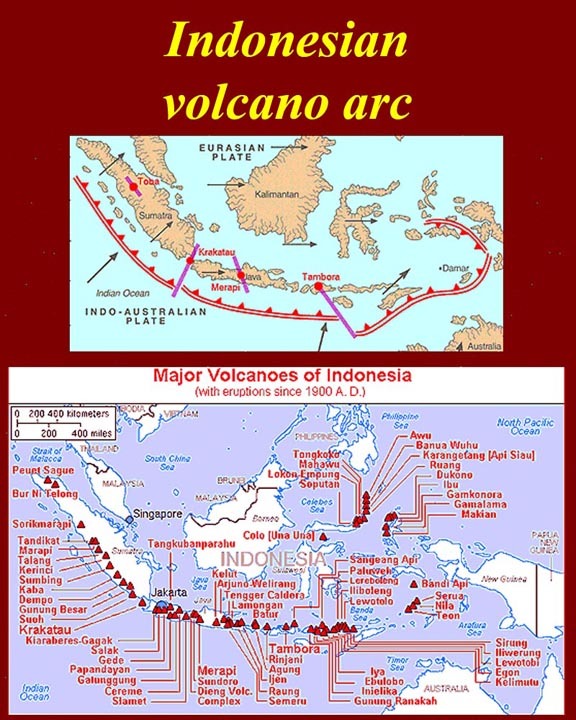 The reason that all of those volcanoes are there is that the Indo-Australian plate is rapidly pushing under the Eurasian plate. 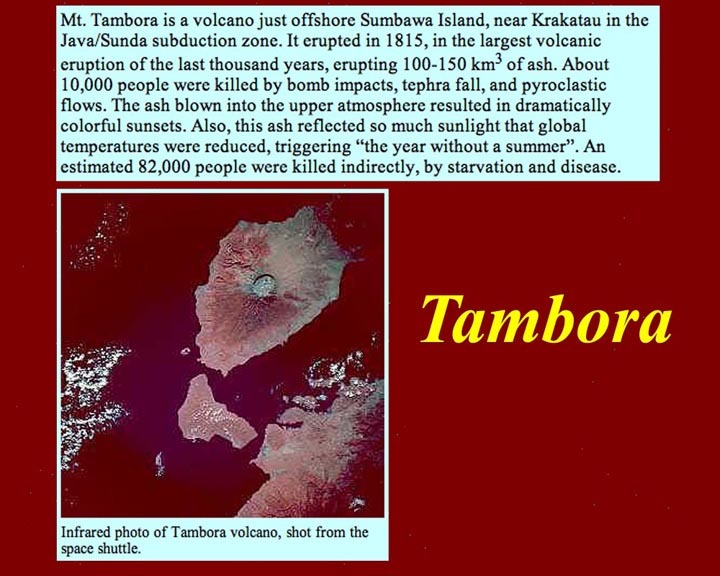 Tambora's eruption in 1815 was the biggest in the last 1000 years: it put out about 100 to 150 cubic kilometers of ash. Tens of thousands died of starvation and disease when crops failed in the "year without a summer". Mt. Pelee today. 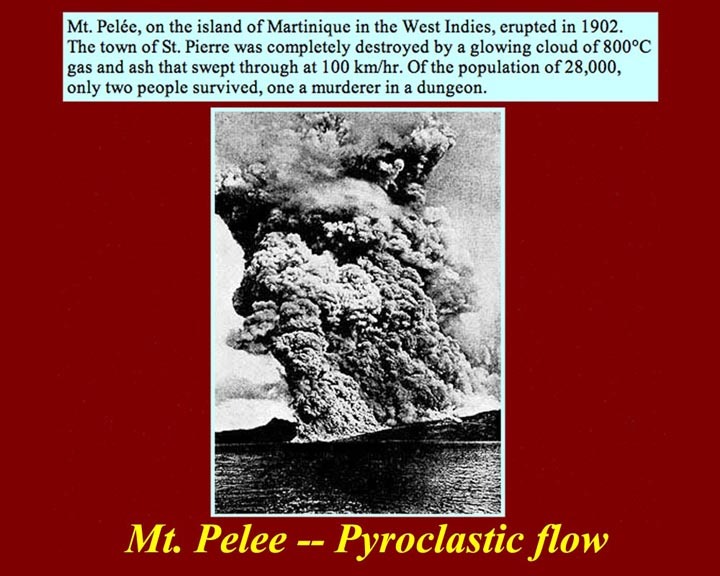 The 1902 eruption was the eponymous Peleean eruption, and the identification of the Peleean "glowing cloud" was the start of our understanding of volcanic events. 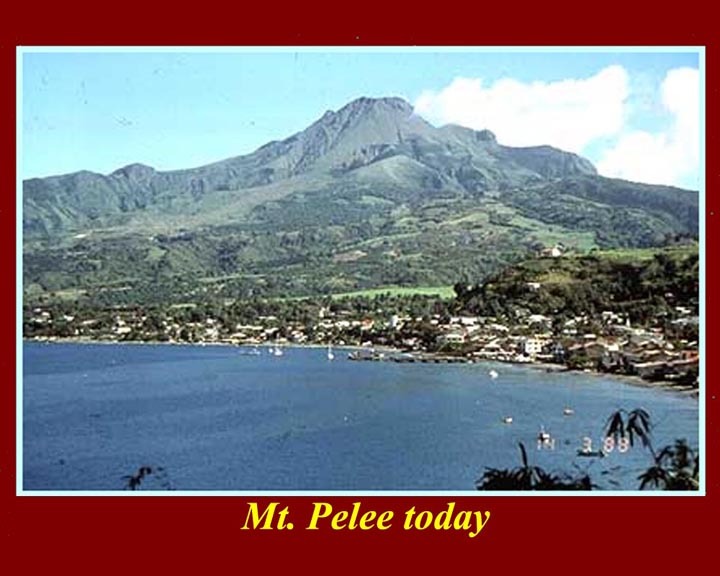 June 15, 1991 brought the eruption of Mt. 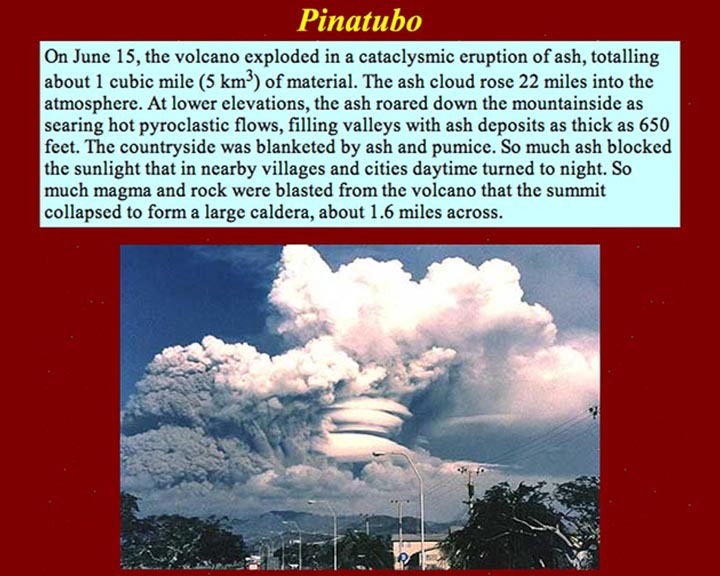 Pinatubo in the Philippines -- another of the volcanoes in the pacific "ring of fire". Its phreatic eruption, after 500 years of dormancy, was preceded by tremors, oozing lava, and numerous fumaroles. 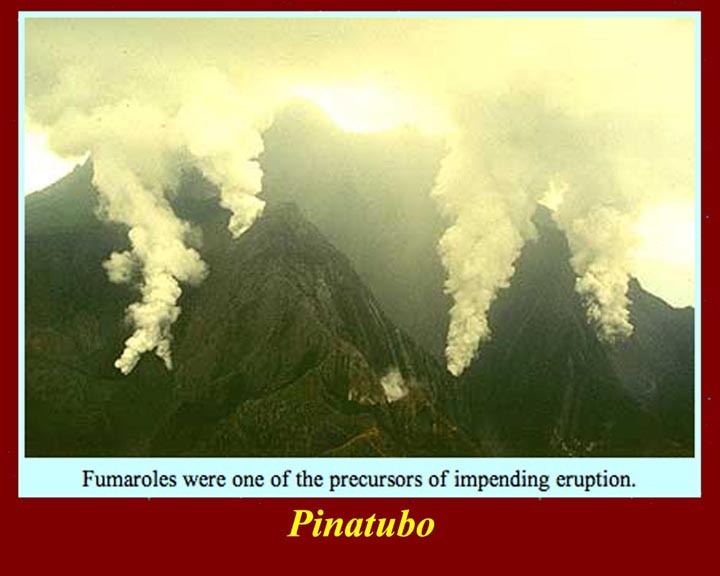 Fumaroles as precursors at Pinatubo. 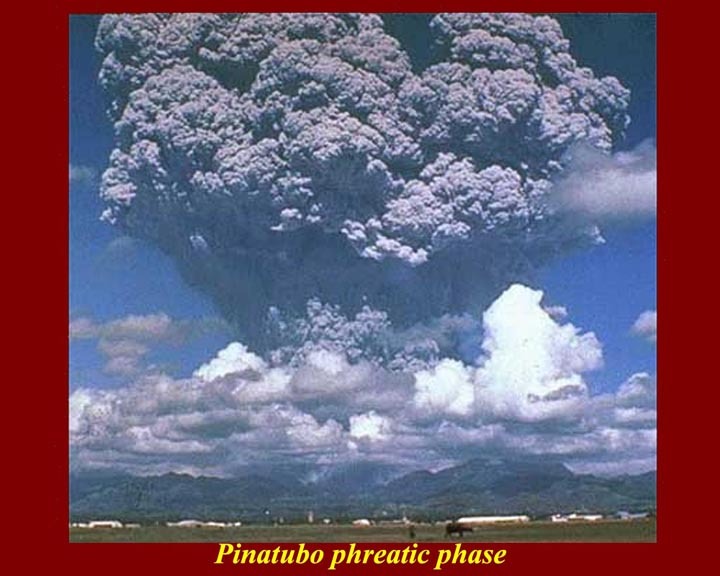 Pinatubo's Phreatic explosion. 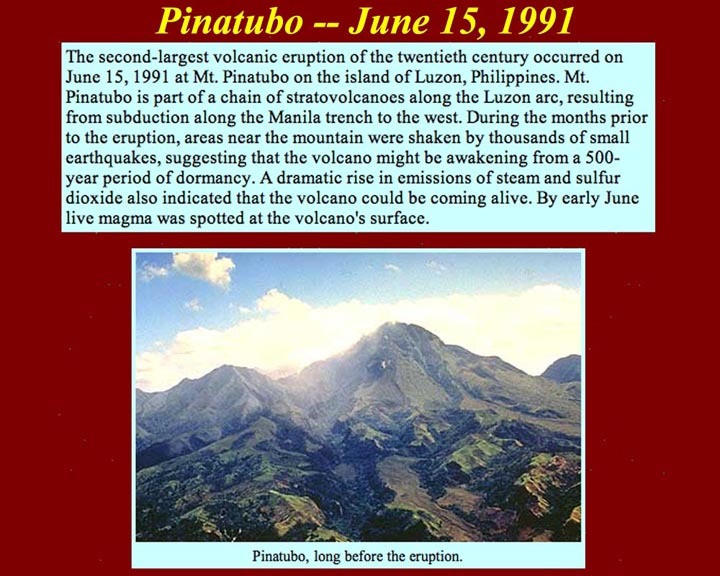 The Pinatubo eruption was the second largest in the 20th century. Pinatubo from a safer distance. A Pacific typhoon struck the Philippines sat the same time that Pinatubo was erupting. 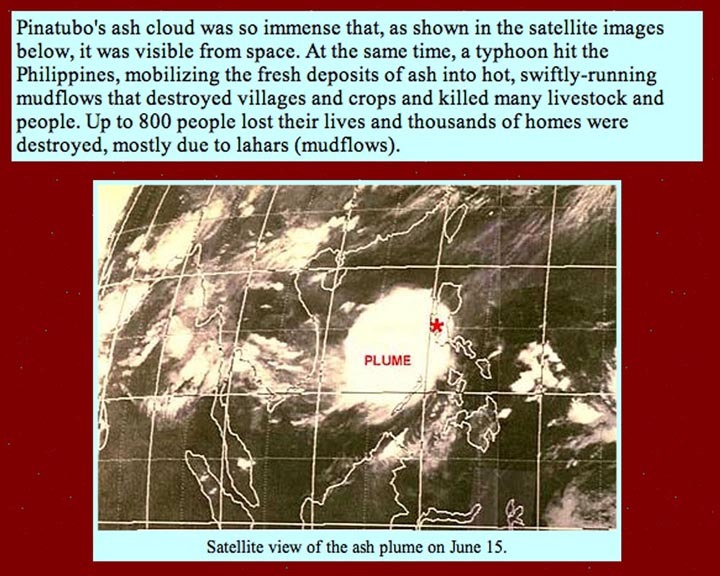 Typhoon rains mixed with volcanic ash to cause deadly lahars. This is a view from space -- the safest distance of all. 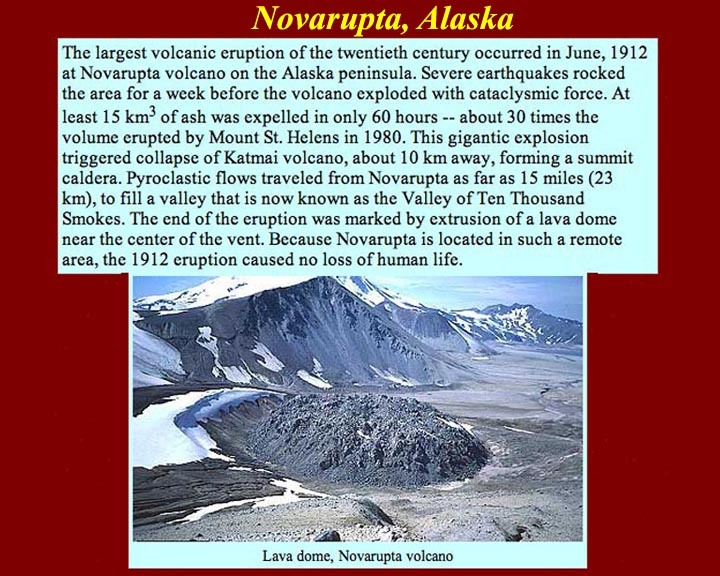 Novarupta one of several volcanoes on the Alaska Peninsula, provided the largest volcanic fireworks display of the 20th century in 1912 -- and nobody saw it happen. It was entirely undocumented until several years later. For more information on Novarupta and the Katmai go to: http://volcano.und.edu/vwdocs/volc_images/north_america/alaska/katami.html. Perspective: Large and impressive as volcanoes are -- even super-volcanoes -- they don't match nature's really big fireworks: supernova explosions. The Crab Nebula is the remnant of a not particularly large supernova. It's notable because it was seen and recorded in both the old world, by Chinese and Japanese astronomers, and the new world, by Amerind observers. 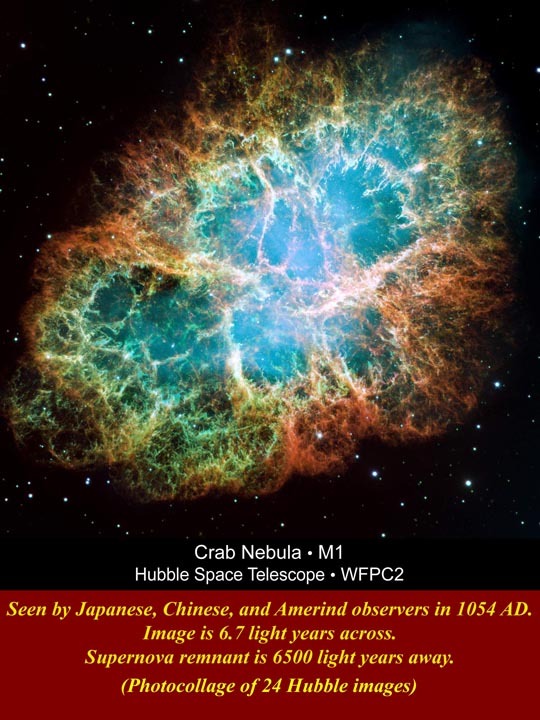 The observations took place in 1054 AD, but the explosion took place about 5700 years earlier: the Crab Nebula is 5700 light years away.The width of the image is a little more than 6.7 light years or about 38 trillion miles. The diameter of the Solar system is a bit less than one fifth the diameter of the nebula.